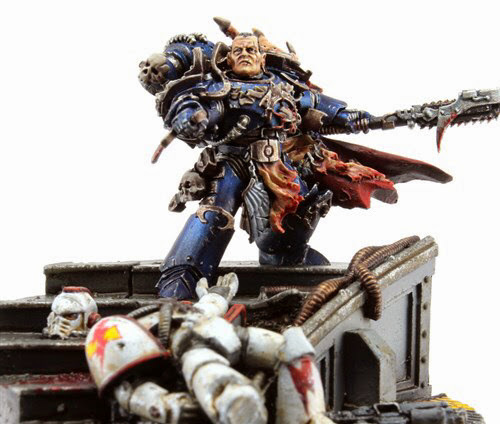 I've always like the Night Lords. Their background fluff and mode of fighting has always appealed to me. However GW never really did them right. Rather than terrifying the upgrade kits released 10 years ago gave them "bunny ears" - cue jokes about stealth impossibility - and so I never got any. I think this might now change. Forgeworld have released Sevetar, the First Captain of the Night Lords and what a great figure. The model comes on a display base with decapitated White Scar (Hurrah). 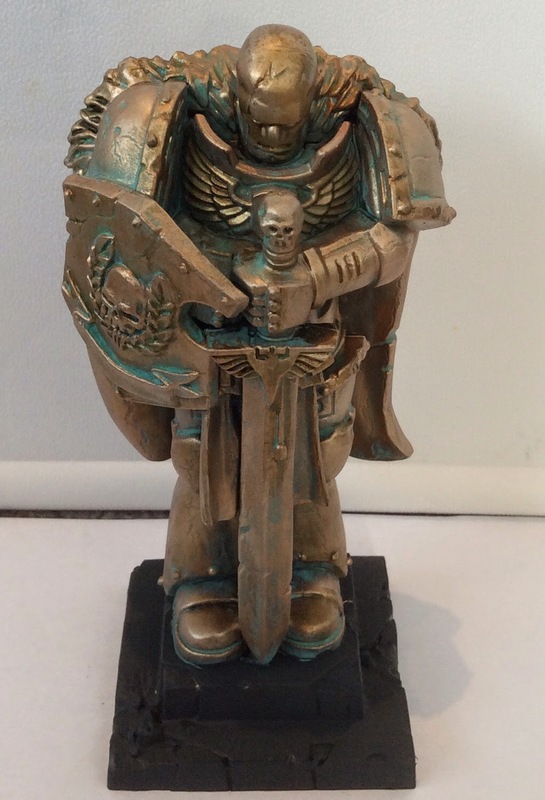 I've also seen the Konrad Curze model and that only adds to the appeal. 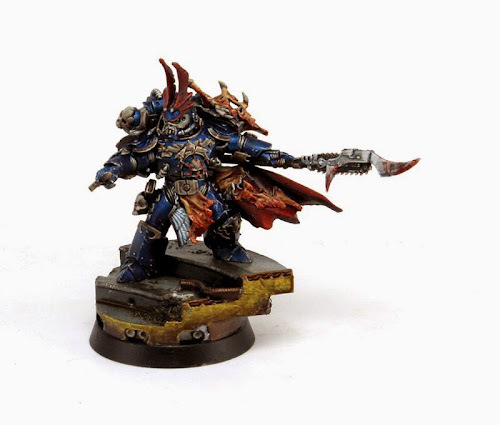 So I may add a unit of Night Lords as an ally to the Death Guard in the very near future. 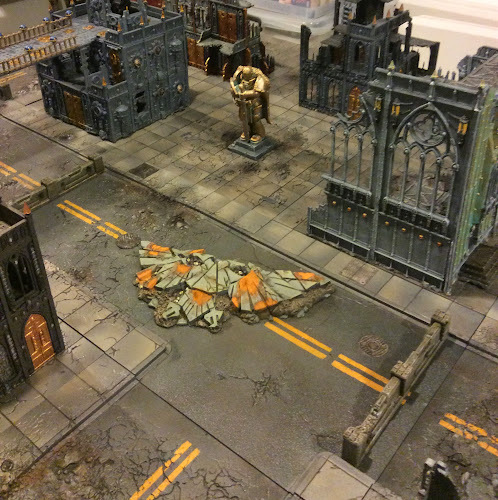 If you attended a Fields of Blood event this year you would have seen the Frontline Gaming Mats I purchased early in 2014. I did a blog post featuring a game on the snow mat which you can find here. Well these mats are now available locally through the Gateway Cyber Café in Tauranga. You can check out their range here. The prices are comparable to what it cost me to import them. I think they are a great product especially if you are wanting to limit yourself to one gaming map. And if you do buy one please mention Fields of Blood. There's nothing in it for us but I like to support local suppliers where we can. After last week posting on why I avoid forums over blogs this post may come as a surprise. One of the things I am envious of the Australian Wargaming community for is the wide acceptance and use of WargamerAu. This is a general Wargaming forum that covers the country, is multi-system and acts a a general focal point for their community. It has been running for the past 12-13 years and is generally the first port of call for Oz Wargaming news both nationally and internationally. I had been giving some thought to whether the concept would work here in New Zealand where a similar focal point for the whole country is missing. There are local forums but no nationwide one. In the end I decided that the best way to see if there was a need and/or sufficient interest. To this end - with the help of Jack - I've created a forum which will launch next week. This forum is not attached to any club, website or indeed person and has been established as a community venture. It is also not system-specific and is free to grow in response to the demands of its members. Initially it has a general forum section covering news, events, hobby and a marketplace, and system sections for Warmachine, Warhammer 40k and Warhammer Fantasy. That doesn't mean other systems aren't welcome and happy to set up sections for any game/genre that would like to use it. To help establish this forum I have reached out and asked people within those three communities whether they are willing to moderate the forum for their particular interest. Jeff Kent, James Brown and Tim Joss will be doing this for Fantasy. Hagen Kerr and Pascal Roggen have signed up for 40k (and I'm talking to a third person). I have also asked Sean Lincoln, Chris Otton and Dave Stent whether they would be interested in looking after the Warmachine forum and hopefully that will come to pass. The forum is not meant to replace blogs but act as an alternative discussion place. Given that it is outside the control of any one person, club or system I'm hoping that it can become a community hub and be a place gamers across the country can contribute or get info. It is also completely separate from this blog. I have purchased a suitable domain name for the site and set up initial architecture but that's where my direct influence finishes. From here the Mods can shape it and frame it how they like. For it to succeed it needs to be community run. I will put up a button on the blog next week so that people can find the site once it launches but from then it's its own entity. Let's test "If you build it, they will come". The Sheffield Slaughter was held over the weekend and attracted a field of over 100 players. What was interesting was that this was the first of the big events to use End Times lists. So, the End Times books do feature quite heavily in the Top 10. There is a certain amount of griping going on on Twitter at the moment but I'm not sure why. Giving people to bring the best bits of 2-3 lists and some super-steroid characters was always likely to result in this. Nobody should be surprised. "How do you live with the shame of authoring the abortion that was the 4th Edition Codex: Chaos Space Marines where you singlehandedly destroyed all the phenomenal work done by Pete Haines and the other Index Astartes authors?" Spent Friday evening finishing the last buildings for the Imperial Sector. I then took some pics and posted them (previous post). 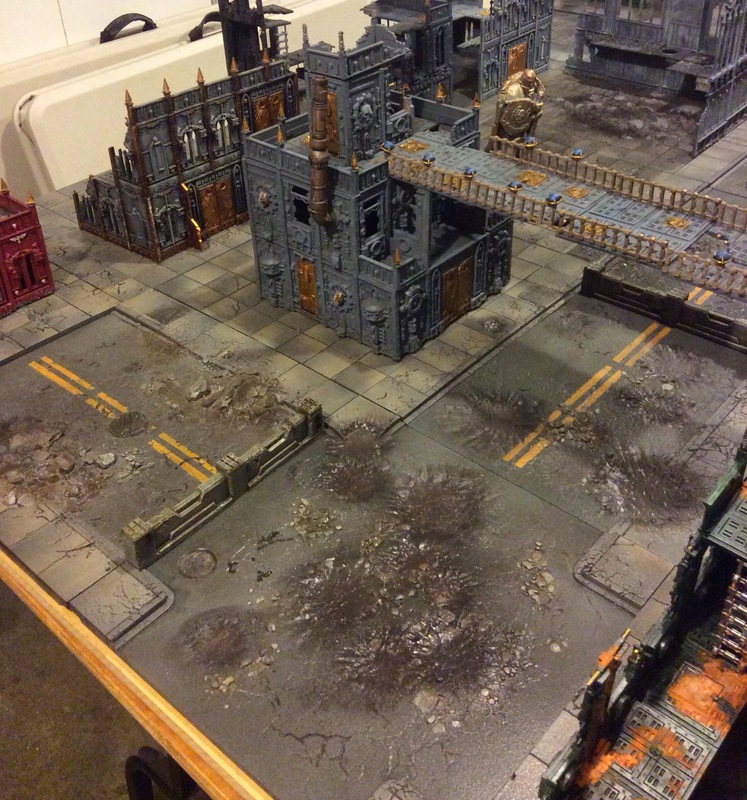 Apart from some scatter terrain I'm happy that's near complete. Saturday morning I ultra sounded and then cleaned my brushes with brush soap. That brought them back to near new ready for me to abuse for another month. Last weekend I had received some painted Wild Riders so I based these, meaning I now have 22 of the spiky little things. Looking at the Woodies I have two Sisters to finish and I may paint up some GG scouts. 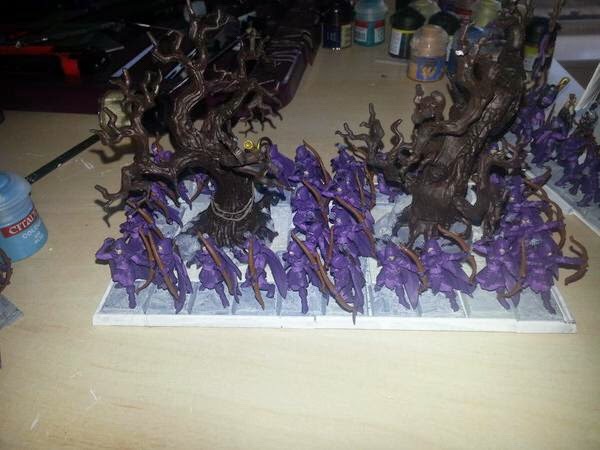 There is also a WarGamma Treeman but then I'm pretty much got all my WE finished. 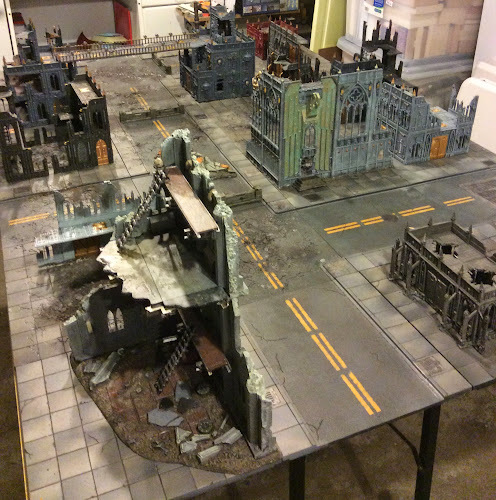 Plans for next weekend are to start re-painting a Gameboard ROB so that I can have a 14' x 4' table for some bigger games I have planned. As always I'll try to get photos and a tutorial. 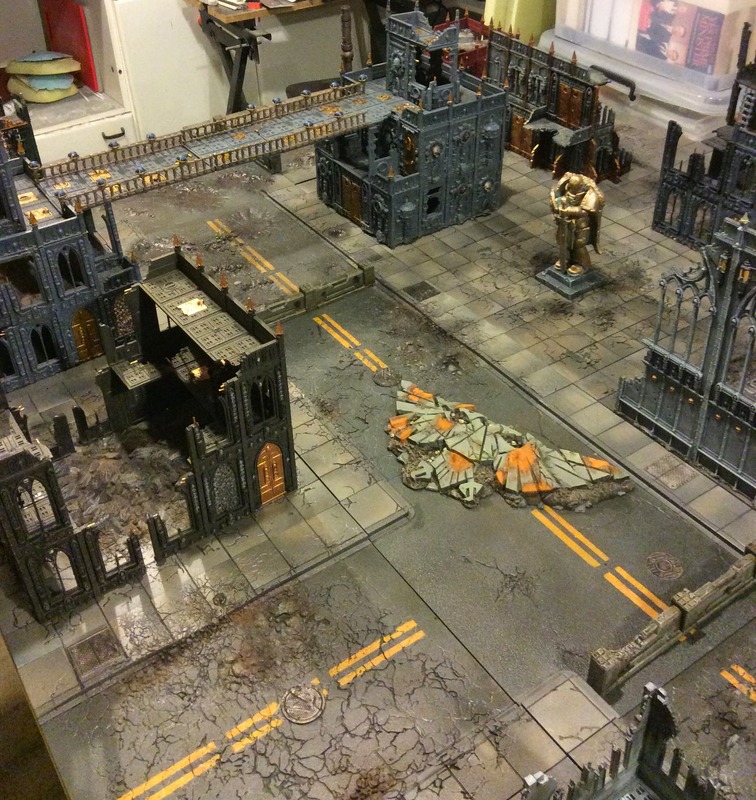 Over the past fortnight I have been reconditioning my old imperial sector terrain for my new Tablescapes table. Here are some photos of the finished product. Sorry they are taken in my garage where I've been doing the work so lighting isn't fantastic and background does detract. Tried some different techniques on different buildings and will continue to work on them when I get more washes and powders. Looking forward to getting my 30k Death Guard Legion out to crush some loyalist scum. Recently I haven't been commenting on new 40k models as I haven't been invested enough in the game to really have an opinion. 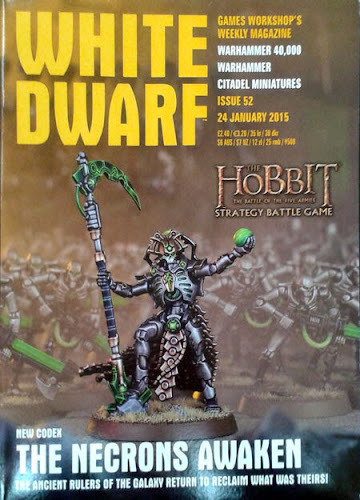 However I saw the cover of next week's White Dwarf and I really like the Necron Lord model featured. 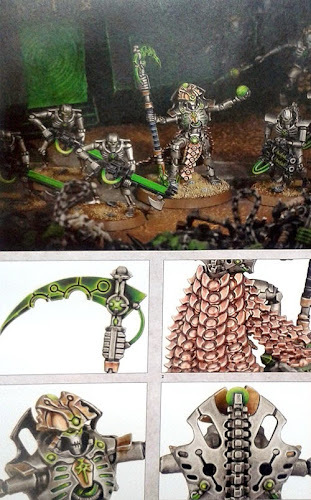 The model seems to tip its hat to the very first Necron models GW released over 16 years ago. 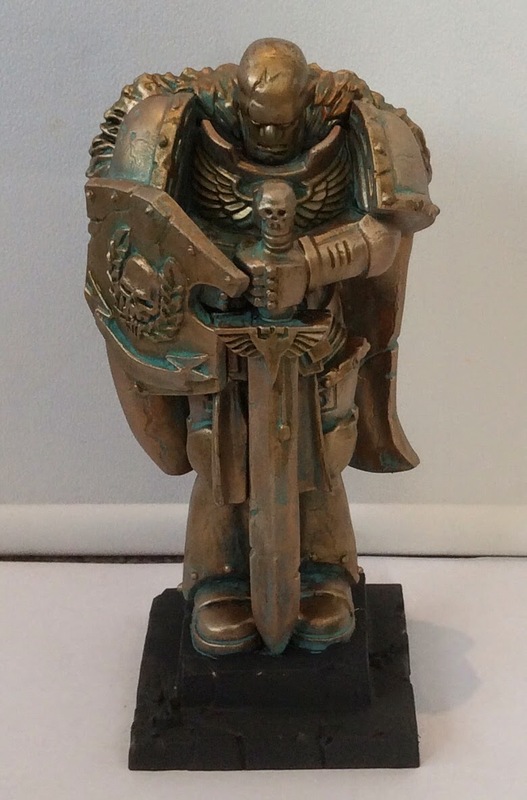 They were metals and I remember they gave one away in the White Dwarf. Here's some more photos showing details of the figure. I really like the scaled cloak and the broad carapace. Well done GW! An excellent sculpt. Last weekend Archenemy was held in Auckland with the Fantasy event attracting 12 players. High Elves dominated with both 1st and 2nd places going to players running PEGs. The rankings have been updated to reflect the results. Next events I am aware of are OTT in Hamilton mid February followed by Fluffycon at Battlecry a week later. Into March there is Equinox in Auckland and then Natcon at the same venue the first weekend in April. All events I get notice of are posted in the Events Calendar on the top banner. 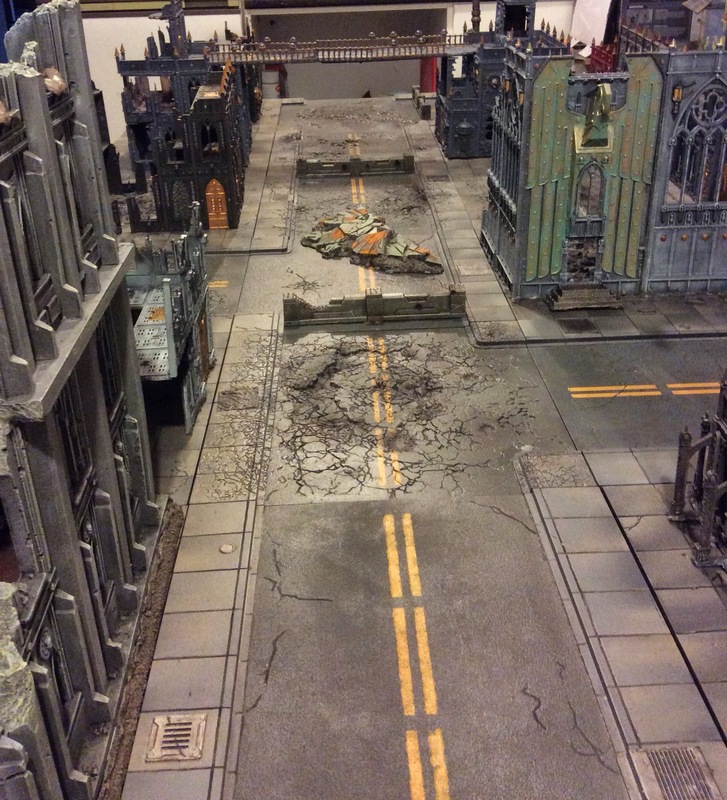 End Times, 9th Edition, Forums, Blogs And Negativity - Or "Down & Out in Tilea"
One of the more popular posts I’ve done here on Fields of Blood was titled “Blogs versus Forums”. In it I looked at why I had tended to gravitate towards reading blogs rather than “participating” in forums. The reasoning centred on the negativity you encounter and the open “trolling” or interaction with “internet warriors”. If anything, the last six months have seen even greater polarisation of this in my mind. Eight to ten years ago I was an active participant on forums and I could troll or rage with the best of them but somewhere along the line I thought “What’s the point?” It started with me writing an incredibly insightful and cutting post where I would (in my own head) clearly demonstrate my intellectual superiority and invariably finish with me hitting the delete rather than send key. Over time I weaned myself off even having to craft a reply. I slowly came to the realisation that there were no winners in forum debates. In fact I’m pretty sure that no-one ever said “Well that vitriolic and cutting post that pointed out my logical inadequacies really made me change my view”. So over time I gravitated to reading and of course writing blog posts. Generally (and in my own case hopefully) the medium means that the posts are more reflective than confrontational. The idea is to provoke thought or in the case of hobby elements provide some inspiration. To this end I have started to require people who post under the Anonymous banner leave their name or identifier. I generally find that the cloak of anonymity “encourages” a more confrontational style and if I’m going to engage with somebody I always find it more polite to refer to them personally. The recent End Times developments – initially rules but increasingly fluff – has seen a ratcheting up of the negativity on the net (again far more in forums than blogs). I find this interesting because for a long time the lack of storyline progression was used as a weapon to beat Games Workshop and now it is the opposite. Admittedly I am relatively lucky as my three favourite armies – Skaven, Nurgle and Tomb Kings – have emerged unscathed (and potentially stronger) from the process. So I understand some of the angst re the Elves, Dwarfs, Lizards, Brets etc but let’s see the end point before passing final judgement. The rules have generally been greeted negatively rather than positively. In a lot of cases they have been dismissed untested. From my point of view I have concerns about some of the higher pointed characters – Nagash, KFA, Malekith the Eternity King – but think a lot of the other new units are good additions. Certainly I’d be happy to use and play against the Mortarchs, Morghasts, Blight Kings, Maggoth Lords, Verminlords, Thanquol and Stormfiends. However I do realise that these are all new add-ons for armies I favour. Up to 50% Lords/Heroes causes concerns. Yes there could potentially be holes but like comp systems that knock the hard edges off, it is relatively easy to put constraints around this rule if you deem it necessary. These were typically being addressed by spam caps/flyer caps etc. The magic system was largely dismissed outright. In my view this was premature as it introduced a mechanism that limited the opportunity to do 6 dice casting. Was it perfect? No, but the holes were identified pretty fast. The biggest concern from my own viewpoint was loose wording and potential to slow down the game. However the forum response was largely negative and we saw a spawning and re-spawning of negative threads. Into this storm were dumped the 9th Ed rumours of the past fortnight. This was the touch paper that a lot of posters needed to “complete” their day. Every interpretation was towards the worst outcome and the extrapolation that occurred magnified this even more. Forums became an even less fun place to visit. My view remains pretty much that we should see the end product before we dismiss things out of hand. This was consistent with my view at the outset. When Nagash rules were released a number of commentators piled in saying how wonderful things were. Some of these same people are now at the other end of the spectrum. In both cases we hadn’t (and still haven’t) seen the full End Times and we certainly haven’t seen 9th Edition. This may well be the End Times but let’s not bury things, hold the requiem mass and post the eulogy before we see how things pan out. Part of the clue is that we are talking about Warhammer Fantasy Battles 9th Edition. It means the game has come through 8 previous editions and the majority of readers are still here for the ride. The rumours are starting to hit regarding the next (and supposedly final) End Times book. As previous noted it is Chaos (especially Khorne) focussed but we see the Orcs involved. 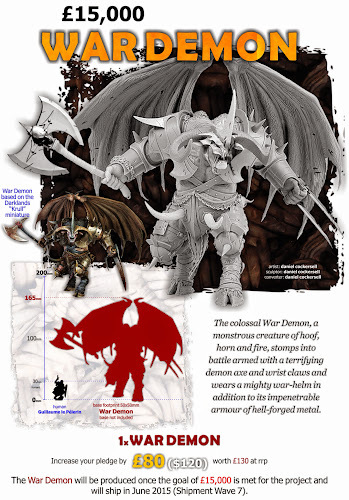 “Archaon is indeed book five of the End Times, and will be new models coming too. It will be released sometime in March. Book one has an artist’s rendering of Archaon weilding the Kingslayer on the cover and Book two’s cover is a very nice picture of the current model of Archaon. 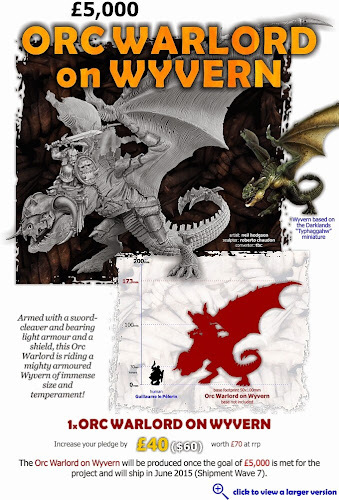 The book concentrates on the forces of Khorne, however Orcs and Goblins finally make their appearance in End Times and Grimgor is featured heavily in this book (with rules). All eight of the Incarnates are revealed, including some BIG surprises on a Shakespearean level. I talked about the blood thirster recently, but there are more units coming too. Khorne will also be getting Skullreapers, and Wrathmongers. I'm not too sure on the two new Khornate units - like a lot of Khorne they seem a bit naff. 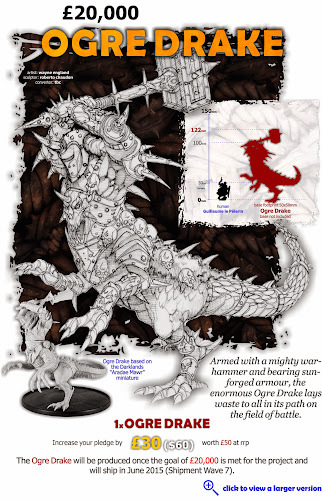 hopefully we still get the rumoured Dragon and Bloodthirster kits. The 40k and Flames of War were updated this morning for two events held over the weekend. This saw Isaac Henderson claim the top spot in the Flames of War rankings displacing Mike Haycock. 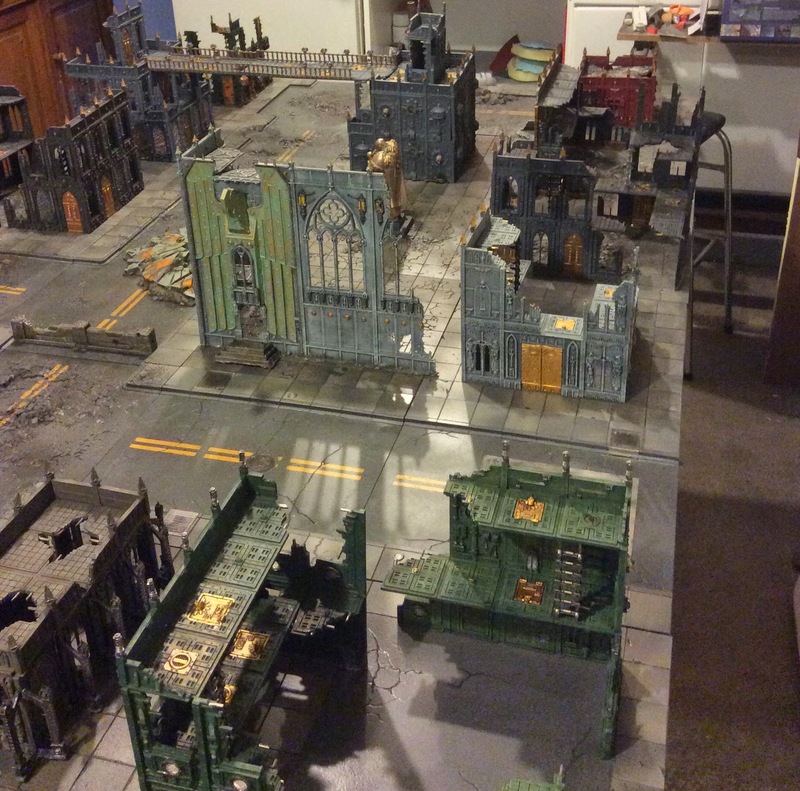 Archenemy in Auckland saw the first 40k event of the year with more than a smattering of Blood angels on the tables. Be aware that this post will contain spoilers so if you don't want to know please don't read. I finished reading Thanquol last night - 400 pages of fluff. The book takes place in three theatres - Lustria, World's End Mountains and the Empire. The Skaven are involved in all three of these conflicts either by themselves against Lizards, Dwarfs and Empire respectively or in "alliance" with another party. I was quite lucky in that last week I read "Headtaker" and Warlord Queek is one of the two main characters in the fluff (along with Thanquol). Without going into Garagehammer type detail of the story, it's fair to say that both the Empire and the Dwarf kingdoms are stuffed. Nuln falls to Thanquol and Middenheim to Archaon leaving the last major Imperial city as Averheim. The Emperor is holed up there and is now being besieged by Chaos under Vilitch the Curseling. In the Dwarf mountains, Karak Azul falls to Queek and then eventually so does Karak Eight Peaks after the Skaven and Night Goblins under Skarsnik come to an arrangement. Clan Skyre's Ikit Claw destroys the Slayer hold after detonating two Hell Pit Abominations filled with receptacles of poisonous gas. In a funny twist the second one dies but then gets up walking five miles through the hold killing all the inhabitants. The background for the story is one of intrigue and backstabbing. With Seerlord Krislitch's death at the hands of the Horned Rat there is a vacant seat on the Council of Thirteen. The other incumbents decide to expel the Grey Seers which hatches a period of manoeuvring where each try to secure the vacant seat to gain pre-eminence. The Seers try to redeem themselves with a plan to crash the Chaos Moon Moreslieb into the planet while Skyre build a doomsday device (enormous WLC) to blow the moon up. Clan Pestilens invades Lustria to try and kill all the Slaan before they can wake and have an impact on the End Times. There are some great descriptions of the battle fronts, particularly in Lustria and the Dwarf mountains. Certainly Karak Eight Peaks turns into a cross between Stalingrad and WWI Western Front. In the descriptions you get a real feel for the overwhelming superiority in numbers that the Skaven have and just how uncaring or unconcerned their leaders are over the loss of life. Typically slaves will be herded in with units of Stormvermin behind them to ensure they don't break. The other continuing motif is the backbiting and treachery between the various Skaven. That no other clan or intra-clan rival succeeds is as important as winning itself. In the end Skyre blow up the moon but the Slaan limit the damage....dying in the act....while a lot of the Lizards begin the Exodus. Thanquol achieves a great victory in Nuln by finally having an ingenious plan work while the Skaven win the war of attrition versus the Dwarfs. Thanquol also brokers a deal between the Council and Chaos parlaying with Archaon and Kairos. To achieve his success Thanquol comes across as a far more likeable character than he has been portrayed in previous fluff. In this he is helped by the Verminlord Skreech Verminking who becomes his mentor and protector. This was a little bit of a disappointment to me as the real attraction of Thanquol in the past has been his truly nasty nature and duplicous approach. That and the failure of his schemes. Here he is almost Disney Thanquol (he's so nice I expect he'll be in Frozen 2 voiced by Tyler Sweft). There is a body count though....and there are some wins and some losses. Belegar has probably the shortest life of any plastic character being killed by Queek. Gobbla dies when the gobbos get involved. Valten is killed by a Verminlord who steps in at the last moment to deny Archaon the kill. Martaz is turned into a throw for Archaon's throne which also features the Emperor's Warhammer taken from Valten's corpse. It is confirmed that Thorek is indeed dead - yay!!! The real unfortunate event is the death of Queek at the hands of Thorgrim. He then sees off an attack from a Clan Eshin assassin only to be assassinated by the Deathmaster as he reflects on the Dwarfs' future. Essentially now the dwarf holds are gone. The Slayers have headed off to the Empire while Karl Franz is holed up in Averheim. The one really interesting development was that while Achaon is the Everchosen he may not have as much power as we thought. Kairos Fateweaver certainly has no fear of him and is constantly reminding him of the debts he owes while the last passage sees a shadowy figure reminds him of Khorne's expectations. I enjoyed the book given my Skavenphillic tendency. I thought the story was an interesting advancement of the timeline. The most important thing I took away is that a lot of the races now accept that the overwhelming numbers of rats mean that they are faced with an unwinnable task - even if they see off Chaos they will be swamped by a Vermintide. This was a long weekend in Wellington so I got an extra day to do hobby stuff. 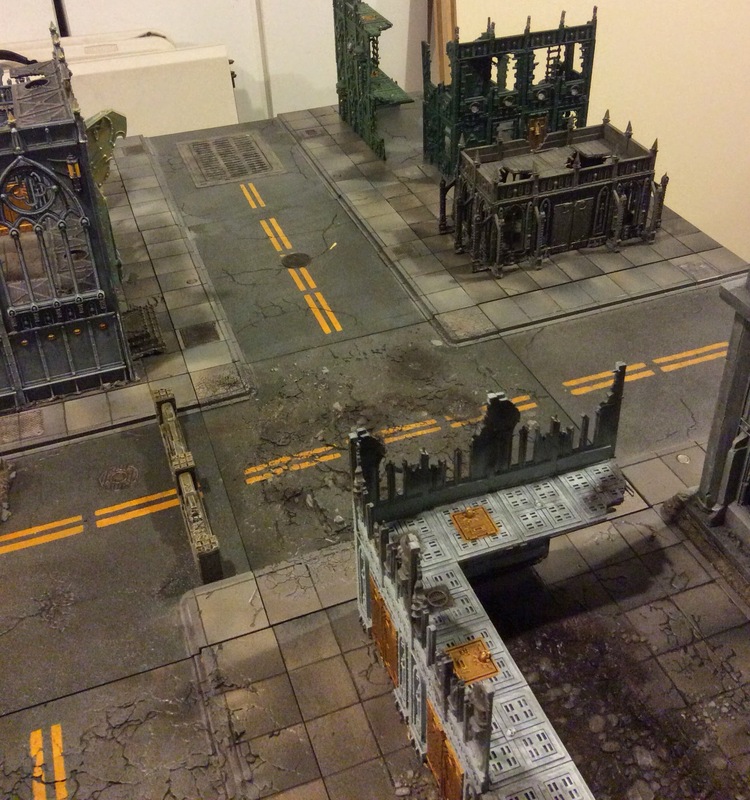 The main focus for me was continuing to work on my Imperial Sector terrain for my Tablescapes board. I've now finished over half of the buildings and intend to finish the rest this week. I also pulled out and started on some concrete barriers that I picked up at last year's Adepticon. They were by WarGamma and fit the roads exactly. On Saturday morning I picked up Skaven dice from GW and downloaded my copy of ET: Thanquol. I've now finished all but the last sixty pages of fluff and I'm loving it. Expect some discussion in the next few days. 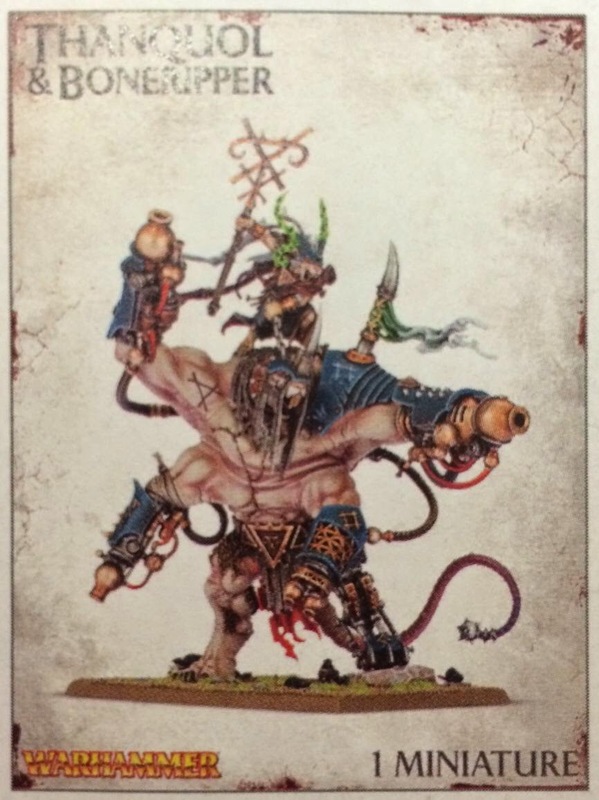 I preordered a box of Stormfiends and the new Skaven characters. Also ordered some more washes and weathering powders as well as some rare earth magnets. Two to three years ago Games Workshop stopped updating its customer base about upcoming releases, be they rules or models. Prior to this, they held seminars at Games Days and showed "greens", "three-ups" and "WIP" of figures. Designers were also open about what rules they were working on. This all stopped and an iron curtain descended over the release of official information from the Company. However GW realised that a vacuum is wonderful and so for at least for the past few years we have had "leaks" to a selected number of individuals who trickle this information out to the market via forums, particularly Warseer. Last week we saw the amplification and cross confirmation of rumours around the future of Warhammer Fantasy. This foreshadowed significant changes in the aftermath of the End Times campaign which is currently nearing its climax. The "squat-ing" of races, the destruction of the current background world, limited factions (I hate that word) and the move to round bases all hit a largely unsuspecting customer base like a sledgehammer (or an exploded moon). Much gnashing of teeth ensued. Now that the initial clamour has died down we are seeing something very interesting. People have reacted in a way that I don't think GW considered. If you read forums, listen to podcasts or even talk to your fellow gamers you'll find an interesting development. People have shelved plans for any current WHFB purchases. There is a thread on the Warhammer Forum and an episode from the always fun Skull Bros Awesome podcast on this very subject. Conversations with local gamers show that this isn't isolated either. 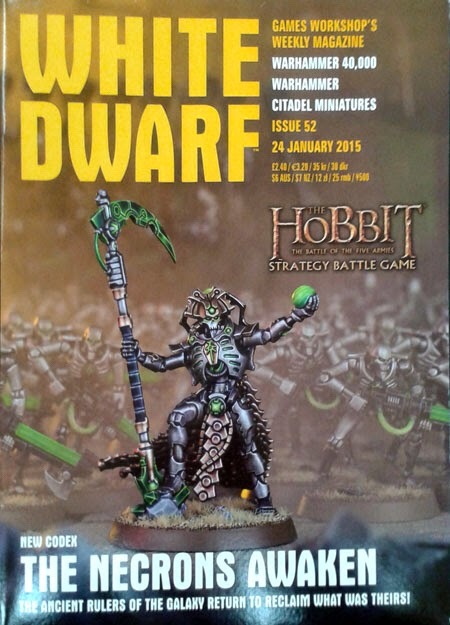 Unless you are a Skaven player you are unlikely to be buying new models at the moment. I can see an absolute drying up of Fantasy purchases until further information is forthcoming. If sales of Fantasy were down before, I can't see the lack of clarity about the future helping in the interim. Personally I'd be very surprised if they were selling much more than End Times books (and a Frostheart Phoenix to Dark Elf players). Mierce Miniatures have just launched a new Kickstarter. Whereas the previous five have been aimed at their Darklands game this one takes a different tack. Here they are taking monsters developed for that game and converting them for a Fantasy setting. Mierce have a good reputation for delivering on time for their Kickstarters. I have previously backed two and have had no problem with eith quality or delivery. This time I'm in for the Wyvern. And we'll see what others they produce as stretch goals are unlocked. 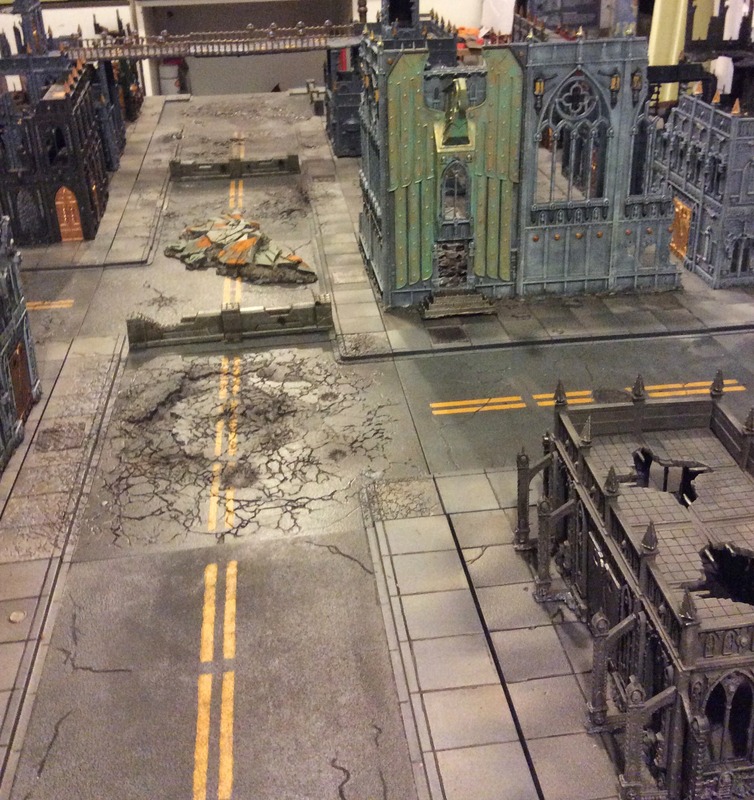 Over the past few years of running Fields of Blood events nothing has caused as much controversy than the introduction of the Painting Checklist. Far more than comp, people got very animated in their opposition. Jack sent me through a picture of the winning army from the UK Masters. This is a unit of 65 High Elf archers....ignore the fact that they are Glade Guard as all elves are one these days. And kids, this is why we have rules. 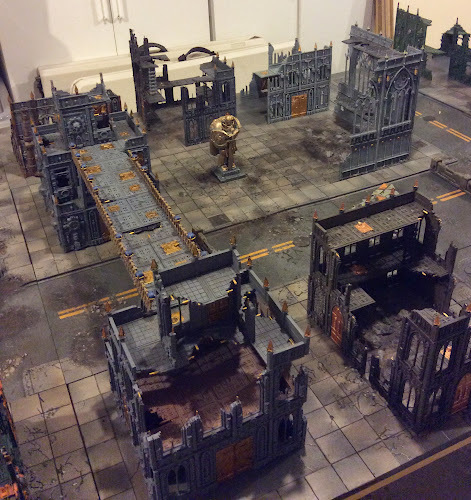 This week I've been repairing and painting GW Imperial Sector buildings. I am hopeful that I'll have them completed to useable state post the weekend. 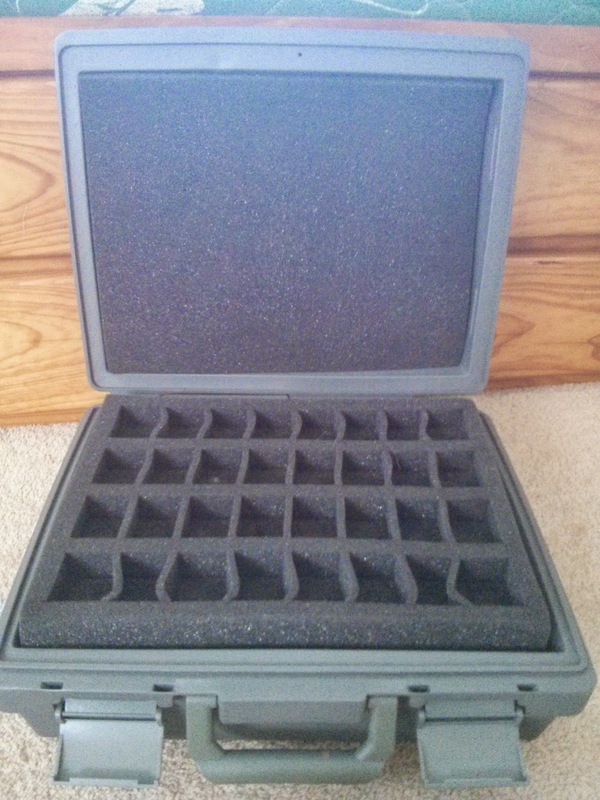 By way of variety, I wandered into the local GW on Wednesday and purchased the Honoured Imperium box. 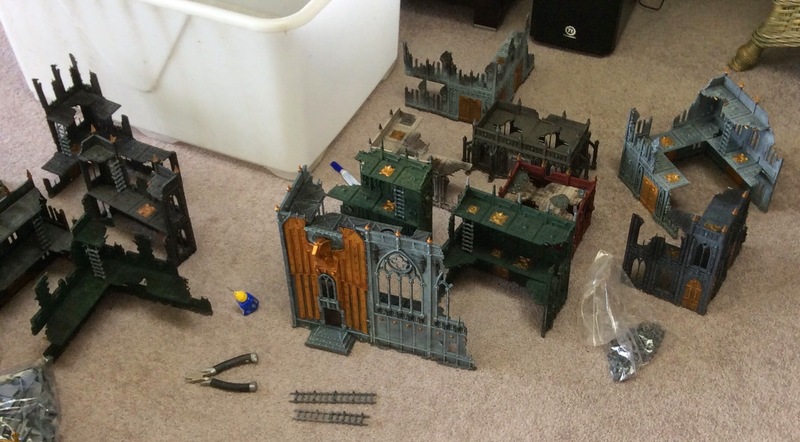 This has three terrain pieces; a broken Aquila, the remnants of a window and a statue of a Space Marine. I put them together on Wednesday evening - 10 minutes - and last night sprayed them for painting. Decided to start with the statue and here's what I came up with. The plinth is still to be finished but I was really happy with the metal and verdi gris effect I was able to achieve. The discolouration was done using a wash I made up a few years ago using a pot of the old Hawk Turquoise as a base but I'm sure GW's new technical paints give the same effect. I will be finishing the plinth and painting the other two pieces over the weekend. 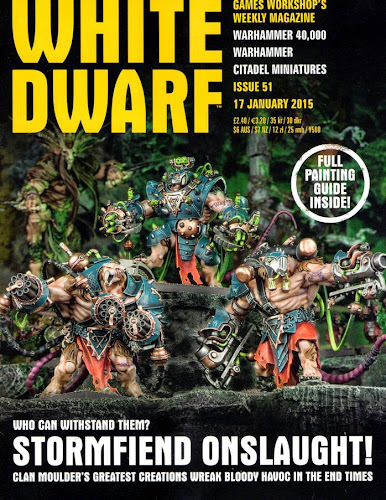 GW released their half year result overnight and it is currently causing some "noise" on forums, blogs and news sites. At a headline level they generated a GBP 6.3 million profit down from GBP 7.7 million for a similar period last year. This was achieved against falling revenues of 6.5% of which about half was due to currency fluctuations. Now everybody is currently a business expert and financial analyst and are pulling apart the numbers and expousing their views. I'm neither so I won't try and sell you as to whether this is a good result, poor result or whether GW are going gangbusters or taking their last breath. Suggest you click on the link and have a read if interested. What I thought I would do though is highlight a couple of things in the report that opened my eyes a bit. Firstly, GW retail operations (company branded stores) operated at a loss of GBP 1.3 million for the six month period. This despite the move to an increasing number of one man stores. This made me think and so I went and looked in their annual report to see how many stores they had. As a May 2014 they had 414 retail outlets of various size. Over the period they had a net 4 closures - opened 12, closed 16 - so as at 30 November there were 410 outlets. These outlets generated sales of GBP 23.7 million. This equates to approximately NZD 47.4 million (USD 36.9 million). Breaking this down, that means sales revenue on a per store basis were GBP 57,800 (USD 90,000 and NZD 115,600) for the six month period. On a weekly basis this means that the average GW Hobby Centre has sales of GBP 2,223 / USD 3,462 / NZD 4,446. Assuming the average shop is open six days a week (mix of 5 for one man operations and 7 for multi-staff stores) then that means daily sales of GBP 370/USD 577/NZD 741. This was a little bit of an eye-openner. Secondly, despite spending GBP 4 million on their new web store sales were largely stagnant (read slightly down) through that avenue despite the release of 40k 7th Ed at start of period and End Times at the end. Thirdly, under "Trade" they say "This channel showed growth in North America, Australia and the UK, offset by larger declines in non-strategic accounts and magazine sales. The net effect was a decline of 5.1%". I'm guessing from this we can assume the sales of White Dwarf Weekly and Warhammer Visions have not been stellar and would appear to have significantly underperformed its predecessor. So a few interesting titbits there to digest. 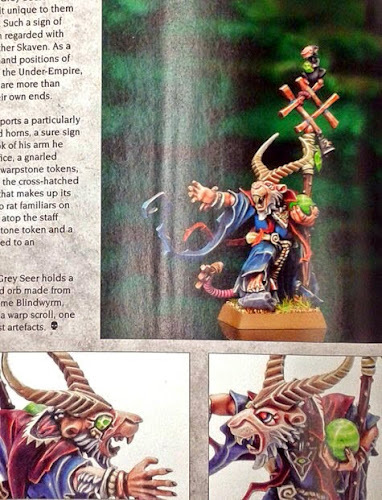 As foreshadowed a couple weeks ago we have a new plastic Grey Seer. Nice model - I particularly like the Warpstone eye - in plastic. We are also getting a Warlord as well. It's very much inspired by the limited release Spinetail which came out with Island of Blood. 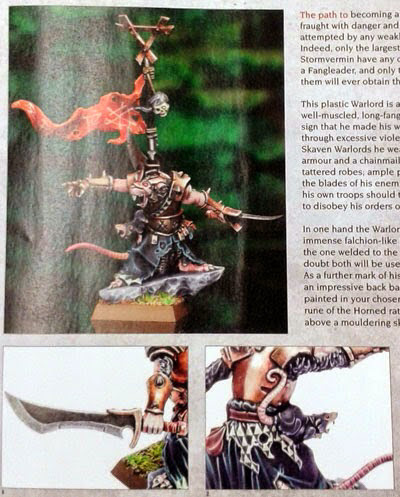 However I think he'll be used more as a Chieftain BSB (with Standard of Discipline) in a lot of Skaven lists. Very much a late Xmas for us rattiphiles. The NZTC is just over six weeks away! Currently there are 14 teams signed up – so a couple less than last year. Lists are due in mid-February so hopefully you are now all starting to think about what you are looking to bring. I know Umpire Tim Joss is super excited about marking 56 lists so if you can help him by getting them in early he’ll appreciate it. I will send out the list template to Team Captains in the next week. Note: The recent GW FAQ up to 50% Lords and up to 50% Heroes while be in place. Instead of using the ETC maps – which are currently the subject of much debate – the Umpire will set up tables as he sees fit. Mysterious Woods and Marshes will be used. The fifth (and final) End Times book will be released at the start of March. Unsurprisingly it is titled "End Times: Archaon" and focuses on the Everchosen. 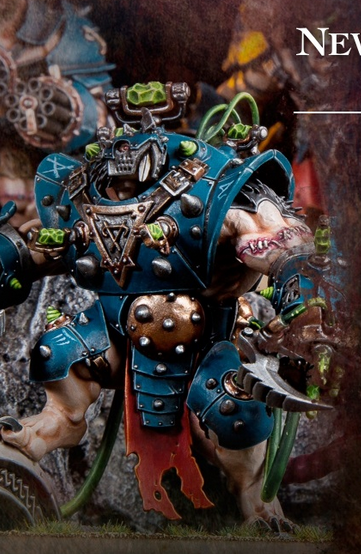 What detail there is suggests both the models and fluff are very Khorne-centric. Not surprising really. Like Nurgle, you can pretty much phone Khorne in. So next week it is the Armoured Rat Ogres "Stormfiends" as promised. They look great models now I've seen them all - but jeez there is a Centurion feel. Thanks to Alan, we know they are Rare so compete with WLC, Doomwheels and HPAs. They are 85 points each and need to be taken in units of three. 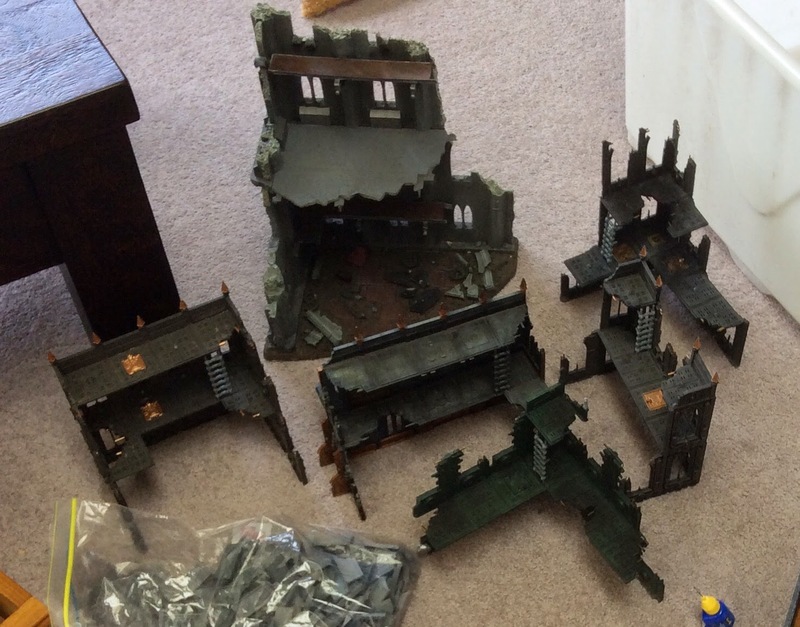 So 600 points means only 355 points left - so you can fit in two WLC and a Doomwheel or WLC and HPA. I've spent the last couple of days watching some cricket and working on my 30k terrain. 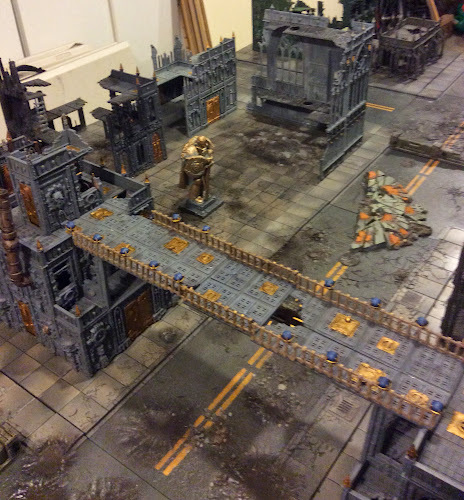 I need a set that is compatible with the Tablescapes Urban Streets tiles and that requires a little bit of work. I had terrain that I had bought and built for the Fields of Blood NZGTs but it had generally only been base coated. It had also been mounted on mdf. However, the tiles have their own ground detail and so for maximum utility I've removed the base boards. The Shrine of the Aquilia has been rebuilt in line with the GW instructions. I have a mix of single to three storey buildings. I've also taken the opportunity to make repairs where necessary. 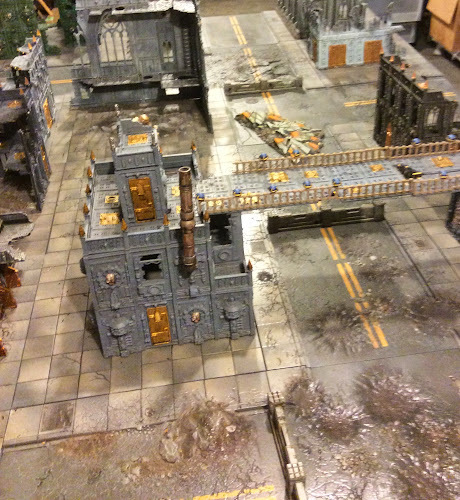 In the background you can see the Forgeworld Tank Factory which also needed some small repair work. From here I am going to do a lot of detail work with paint, powders and washes. The plan is to have the project completed in the next two weeks. Once it is completed I'll post pictures. In the background you can see the new the ratling gun arm of one of the ogres. Why am I thinking "Centurions"? 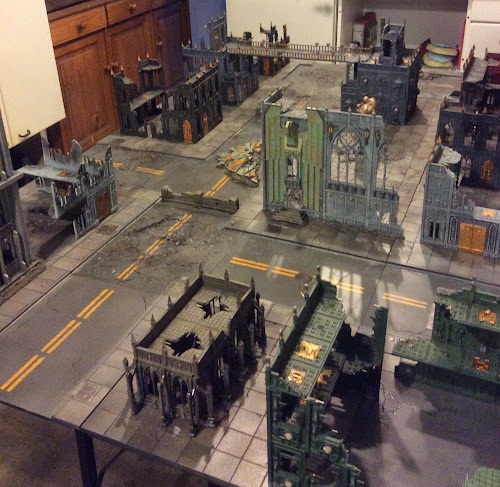 This weekend I intend going through my boxes of 40k terrain with a view to fitting out my new Tablescapes table. I have a series of Citifight buildings I created about 7-8 years ago that I'll look to refresh for the table. 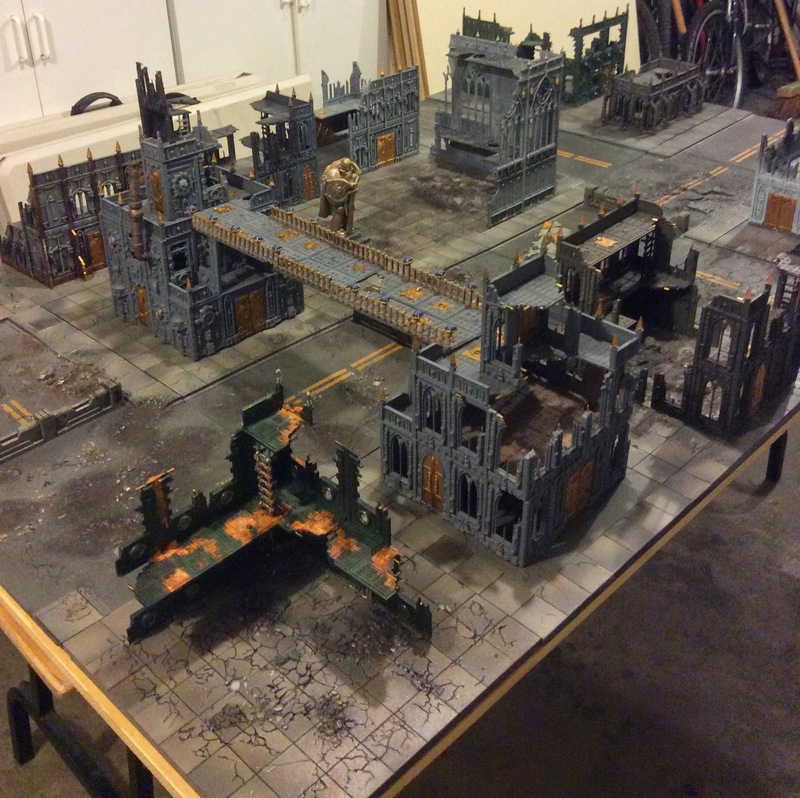 Included in these is a large "Palace", a FW Tank Factory, Shrine of the Aquila, numerous GW Imperial Sector buildings plus ruined buildings made from various sources. These will get dragged out and "refreshed" over the weekend with a view to having pictures of a full table up here by Monday. Check back and see how I get on. Following on from yesterday's post about the supposed changes to Warhammer, the dam has burst and all manner of commentators are publishing "information" across the net. There are a lot of things here that fill me with trepidation. The first is the supposed removal of races. I've never been a Dwarf-friend but I hope that they do not invalidate a whole race like is being suggested - effectively reducing them to Special/Rare choice in an Empire army. Similarly returning all Elves to effectively High Elves seems a slap in the face to those who have supported the company by purchasing Dark Elves and Wood Elves over the previous decades. If this came to pass what would it mean? Well quite a lot of things. It would mean that the GW beancounters have run numbers and determined that there is more profit in alienating a large section of their current WHFB customer base as a result of future sales. The anecdotes are that there is not sufficient money in the current practice of 4-5 year race refreshes as we currently have now. People don't buy whole new armies, instead they use existing models and in some cases upgrade. GW would be betting on a full refresh attracting sufficient new players (and keeping a proportion of existing players) to be financially more attractive. I don't know. it seems a big roll of the dice. When you talk to current WHFB players, the most commonly heard refrain is that 8th Edition is the best version yet of the game. Looking at the existing Warhammer Army books, the game is seen as the most balanced it has been. All but three races have got the 8th Ed treatment and of those three Skaven and Brets are still very usable and Beastmen would be with the addition of Chaos Marks. What has been missing is FAQ support by the company for almost 2 years. However the things that need clarifying are minimal and generally could be sorted in an afternoon. So where does that leave things? Well I can see that if the changes talked about were implemented then GW could leave a considerable rump behind. Certainly I think the WHFB community would become fragmented as most (?) / some (?) players adopted the new 9th Ed while other gaming groups continued to play 8th Ed. Over time a few of things would likely happen to those playing 8th. Firstly, you'd see the rise of a Direwolf type body which would quickly sort out existing FAQ problems. This would be great for the game and those playing it. Secondly, the tournament scene would fragment leaving smaller and less commercially viable events. Thirdly, and probably most importantly, the 8th variant would eventually wither and die primarily due to the lack of new blood coming into the player pool. How long this process would take is debatable. I've seen similar fragmentation in Ancient Historicals since 2003 and this has led to a dozen years of stagnation and dwindling overall numbers. There have been instances in the past where companies have introduced new systems so unpopular that they caused a radical rethink by the owner. The most oft quoted of these is D&D 4.0 which apparently proved so unpopular it was eventually overhauled to something that replicated its preceding iteration (I may be off the mark here I've never played the game). And GW has shown itself to react to falling sales - evidence being the 18 month overhaul of W40k 6th to 7th as people deserted the system. The difference in this situation is that WHFB is not the cash cow that Space Marines are and so the imperative is not as critical. 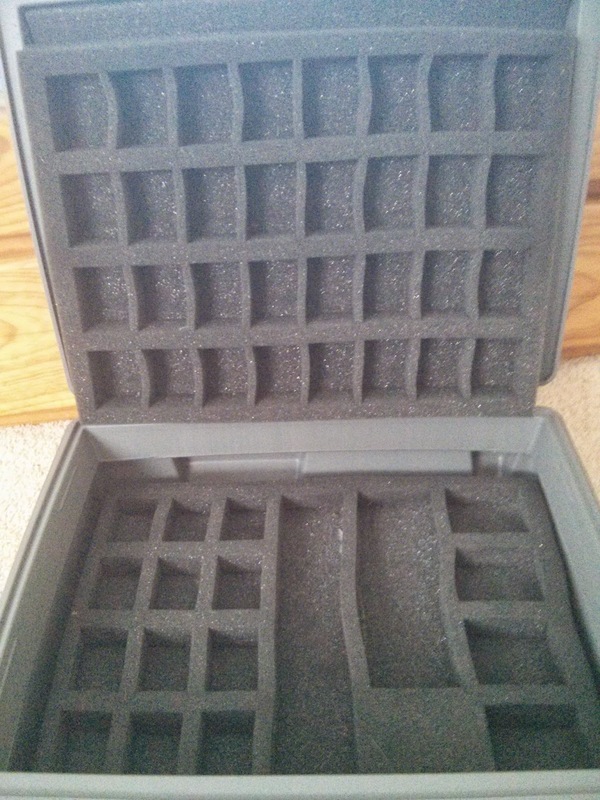 One thing that will indicate whether GW is serious about wanting to keep existing WHFB players concerns basing. Nothing turns people off a new system as much as having to rebase figures. There has been talk of moving to round bases with the move to 9th. That would signal to me a scorched earth policy by GW - effectively forcing people to choose to embrace the new system or not. Personally I'd see that as a major negative move by the company. Thanquol - A Warhammer World Super Hero!!!!! At the moment I’m like a Vermin Lord with two tails…..I can’t wait for the Thanquol book to be out. I’m hoping that the fluff will see the launching of the Skaven masterplan and we’ll see the southern part of the Empire (especially Nuln and The Moot [I hate hobbits]) as well as the Dwarf holds swallowed up. For those purveyors of Skaven fluff, you will know that Thanquol is a genius who comes up with incredibly intricate, well researched and thought out plans but he’s been incredibly unlucky/let down by incompetent minions. Thanquol hates dwarfs (especially Slayers) and the Empire (especially poets). However, this resourceful rat planned the invasion of Nuln and was only just unsuccessful as well as being the owner of the Warhammer World’s only submarine. I’m expecting big things from him in the End Times. Assisted by the fifth (or is it the seventh) incarnation of Boneripper, this could well be his time where he lays the world to waste (perhaps even smiting that uppity goblin Skarsnik (metal model) in the process). With Skaven technology and superior brainpower, what can go wrong? 2015 - The Death Of Warhammer As We Know It? The past few months have seen a lot of navel-gazing as people have tried to work out where Warhammer has going, first with the End Times and then with 9th Edition. There have been tales of impending doom, game resets and annihilation. Generally I have taken this with a grain of salt as people will always try to fill a vacuum. The following appeared on Warseer over the past 24 hours and sets out one view of what is "happening" to Warhammer and what we can expect in 2015. Now I don't know if it is true or how much credence it can be given but it is an interesting read. 9th Edition to pick up where the ET leaves off in fluff, plus a couple of hundred years or so (to reboot the setting). New faction... heavily armoured, religious, "good" human warriors fighting with the power of the gods. (Warhammer Space Marines, basically). Karl Franz Ascended seems to be the prototype or precursor for this concept, AFAICT. 9th edition will have 6 factions. Model diversity cut in half shelf space. New world and new age so current factions and lore aren't recognizable at all. Each new faction has like 3 core units that will always be on the shelf. Much faster releases of stuff, mainly characters and special units of 2-5 fancy models (like Morghasts) that have their own rules right in the box, so not dependent on a static army book. Many of the these non-core models are only available for a limited time (say 6 months to a year), so they don't take up shelf space forever and ever. Many existing models are not usable in 9th. We can expect the next edition of Fantasy to throw everything up in the air. The whole End Times move has been to wean people onto a whole new take on the Warhammer world and it's going to start with every army being "chaosified". We can expect army play styles and appearance to change quite dramatically and there will be a whole load of new models being released early on to tie everything together. This has caused quite a stir back at GW HQ as there are a lot of people behind the scenes (some of which are very well known to us) who don't like the changes that have been made. I have also been told that the models due to be released are some of the best to date! '9th' [or] whatever is next for fantasy [...] coming 2015 in the summer. The new faction [plus] future releases after this point for five 'existing' factions (which plus this would make six) […] but I think there will be [...] more. At first glance, I so hope that this is wrong. At second glance I so hope this is wrong also! To me it sounds awful. If it did come to pass I can see a fracturing of a the Warhammer Community that would make the 8th Ed Rage Quit look like a minor disagreement. For me the beauty of Warhammer is the scale - big armies/units - and the diversity of the races. This appears to dismantle both of those attractions. Now I don't know if this will come to pass but the drums are starting to beat with reoccurring messages. The idea of invalidating models and races would be seen by the community as a "betrayal" - and I don't think that is too strong a word for it. 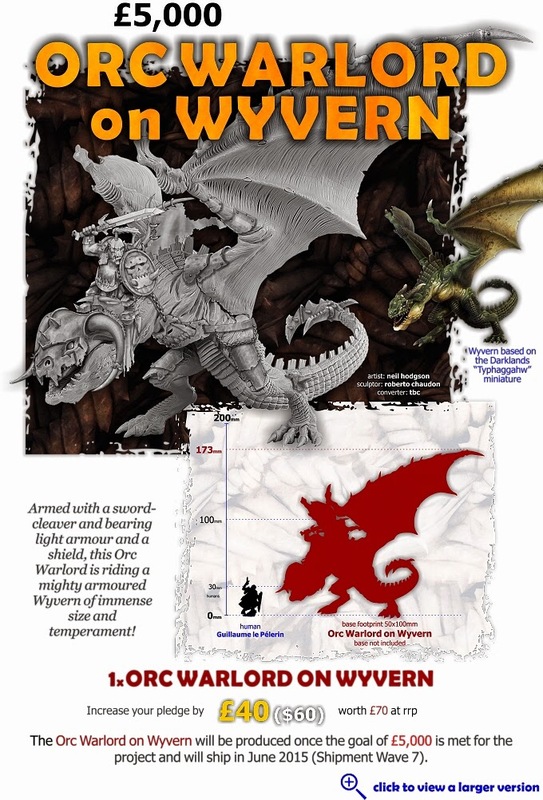 The driver is apparently the need for GW to "own" their IP and restrict the copying of their models. A lot of the concepts that are being talked about have been trialled over the past 24 months - limited editions, restricted print rounds, splash releases - so the mechanisms are there. Is the sky falling? not yet. However some of the dark clouds have got me worrying for the first time. I've always enjoyed the Gotrek & Felix books. They are a pretty light read but are set against the backdrop of the Warhammer World which provides some gaming colour. The premise of G&F is a Trollslayer seeking his doom as penance for past shame. Over Xmas I read "The Serpent Queen" which detailed travels in the Southlands and Nehekara. It gave some excellent commentary on Tomb King culture and society, as well as being a good story. With the release of the End Times, Black Library are releasing a final trilogy for G&F. The first of these is "Kinslayer" which I read over New Year. It is set in Kislev and the Troll Country and is contemporaneous with the current End Times books. The story sees a lot of the characters from previous books being thrown together by circumstances north of the Auric Bastion in Kislev. It backgrounds the schism in the Chaos ranks where Throgg has taken Praag and refuses to allow entry to human Chaos forces. Finally after what must be 15-20 books we find out the "shame" of both Gotrek and also the other Slayer, Snorri Nosebiter. No Skaven interaction....sad face.....but it is interesting that there are 3-4 mentions of the Chaos Dwarfs' activities - something GW has avoided in the "official" End Times books. Kinslayer is a good fun read. Well worth the price of a download. During my time back in NZ I found a couple of things packed away that I no longer need, and thought I would post them up here before going to TradeMe. 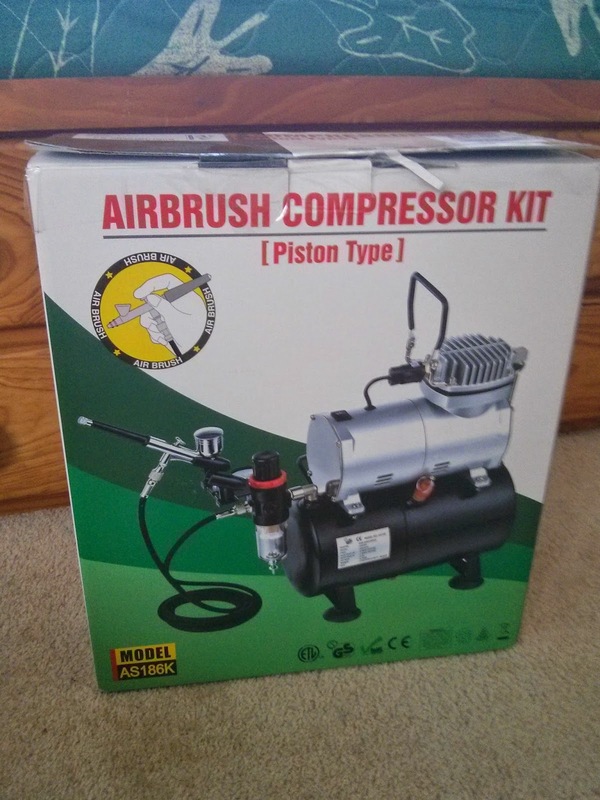 I also have an airbrush compressor with tank that I used only a handful of times before leaving. You can get these on TradeMe for about $160-70 at the cheapest, I'm after $120. If you're keen or have any questions let me know. They're both currently in Auckland but we can sort out shipping too if needed. 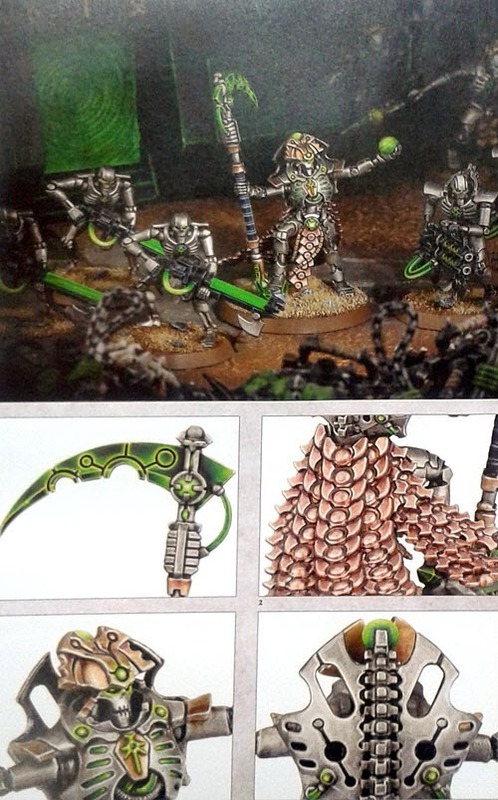 So we have a sighting of the new End Times book plus Thanquol and Boneripper. Boneripper has four Warpfire Throwers as arms! 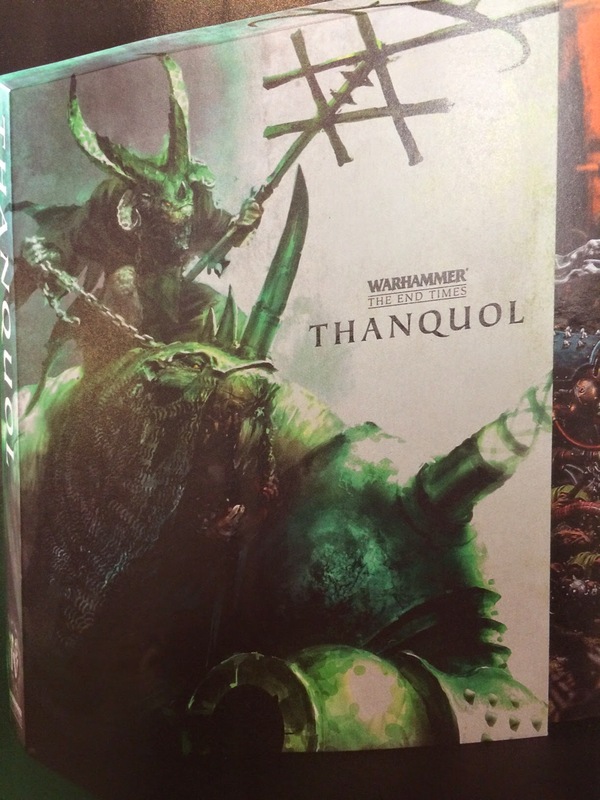 Bit disappointed by the completeness of Thanquol's snout.